Private Ben Pennington died after contracting the Spanish Flu while assigned to assist with quarantine efforts in El Paso, Texas. As Spanish Influenza killed millions throughout the world, officials in El Paso requested assistance from the Texas Rangers. Private Pennington and Private Robert E. Hunt were dispatched to keep order. Both men contracted the influenza. Private Pennington became ill on October 7th, 1918, and died on October 11th, 1918. Private Hunt died on October 16th, 1918. Private Pennington was a well known officer and over his career had been shot 16 times and lost an eye in various gun battles. He was survived by his wife. He was buried in the Jackson Cemetery in Bell County. Private Pennington had served in law enforcement for a total of 20 years. He had served 12 years as city marshal of Holland, in Bell County, and eight years as an elected Precinct 3 Bell County constable. 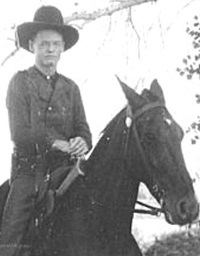 On October 4th, 1917, at age 56, he enlisted as a Texas Ranger and was posted to Brewster County in far West Texas. On today, the 100th anniversary of your death I would just like to say thank you for your service and sacrifice for the citizens of the state of Texas.